January has been such an amazing month and this week’s Saturday Spotlight guest sees the theme of inspiration culminate in the best possible way. 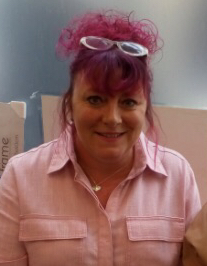 Please welcome to the Lady Janey sofa, the very lovely and inspirational Sara Reader from Cheltenham Open Door. I asked Sara for a word or phrase, which captured the spirit of life at Cheltenham Open Door and her response was ‘Unconditional kindness’. Sara went on to explain that ‘it’s like having an extended family…. 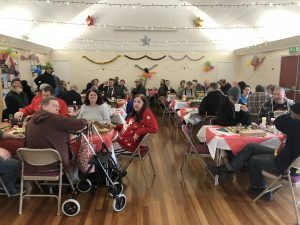 I am there for them and they are there for me.’ People often associate Cheltenham Open Door as an organisation for the homeless but the reality is very different. 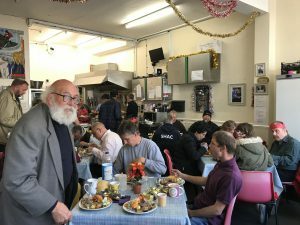 Yes they do support local homeless people but they also provide an open door to those who experience loneliness, have social or mental health issues or indeed anyone who just needs a chat and a friend or a bit of time out from their chaotic lives. People who visit Cheltenham Open Door are often seeking somewhere to go where they feel wanted, valued and most importantly ‘Listened to.’ In essence, it is a warm and safe haven where staff and volunteers provide invaluable support for vulnerable, disadvantaged and lonely people. Sara is often asked about ‘success rates’ concerning the work they do and she says that ‘Success is that someone has had the courage to step through that open door, have a coffee, spend time with us and by doing so take the first step towards any help they might need.’ Sara herself took great comfort from the charity and says that ‘It’s a safe environment…………Everyone who has come here, has gravitated with their own issues’. 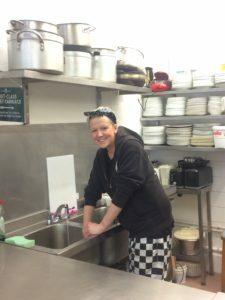 The realization that she ‘Needed them as much as they needed her’ was really significant for Sara who, since joining Cheltenham Open Door, has devoted her life to supporting others just like she feels they have supported her. When I asked Sara about the worst part of her job, she said that that there are sadly some times when ‘Lives end and not always in good circumstances’ and my heart just went out to her. Sara went on to say that what took a lot of learning was that you do ‘Really need to try to go home and switch off’ at the end of the day and that you ‘Can only do so much.’ With the wealth of distressing issues that the team comes across on a daily basis, this is easier said than done. In the world where Sara and her team deliver such an important service to the local community, we discussed why levels of Customer Service in the outside world as sadly lacking today. Sara thinks that this is because ‘Nobody wants to take responsibility anymore’ and that the service received ‘Never seems very human.’ This is far cry from life at the shelter. Life has been somewhat of an emotional rollercoaster of a journey for Sara and she is so grateful for the support of her close friends and family and in particular her daughter Natalie, who she says she is ‘Very lucky to have.’ She is very proud of her ‘3 beautiful grandchildren’ and describes Natalie, who lived her teenage years in the midst of the issues Sara experienced, as being her very ‘Best Friend’. Every contact I have with Cheltenham Open Door is thought provoking, moving and incredibly inspiring. If I’m ever half the person that Sara is, then I’ll be a very very happy one because as she says ‘Kindness costs nothing’ and she certainly has a lot to give. 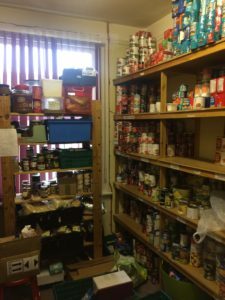 If you’d like to support the charity then please take a look at their website where there is information as to the donations they need and the ways you can help. 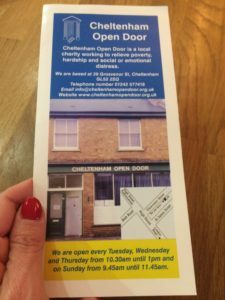 Cheltenham Open Door is also on Twitter and Facebook. 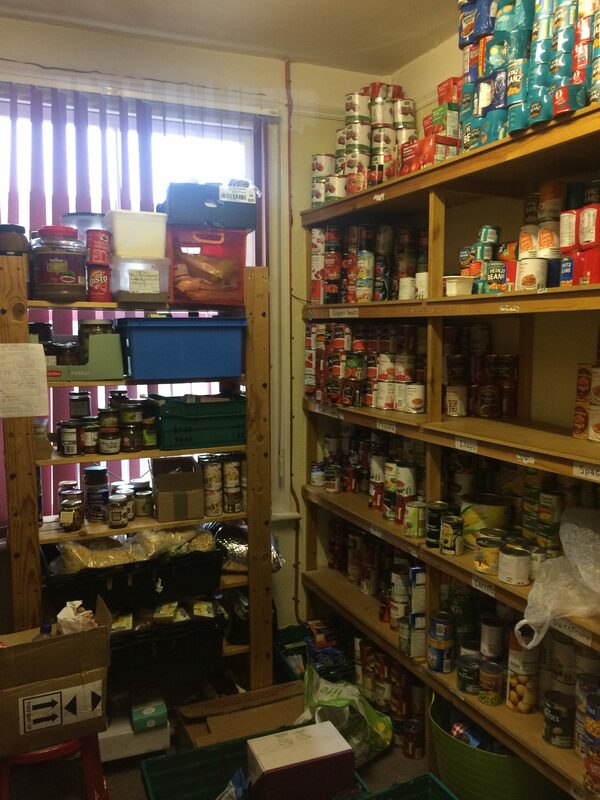 Last week a record number of food parcels were prepared. Please do help if you can even if it’s just by sharing this post. Thank you to Sara for chatting to me today. There certainly has never been a Saturday Spotlight like this before and I doubt there will be again.